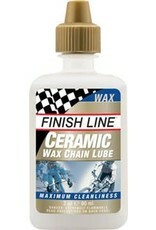 Advanced wax-based lubricant that goes on wet and dries to a wax coating. It provides maximum cleanliness and performance in dry, dusty and off-road conditions. The ceramic particles build up after each application extending the longevity of the lube beyond typical wax lubricants.